NamanaLiri™ Minerals: What a Surprise! 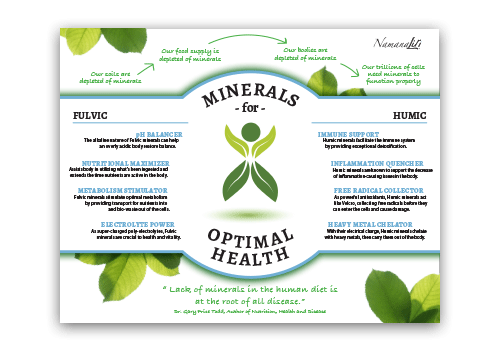 To find out more about the benefits of humic and fulvic minerals check out our Humic Fulvic Primer. Our minerals are mined from ancient plant deposits, using green methods. A process which gently and rapidly releases the pure minerals along with the precious fulvic and humic properties, while reducing energy consumption, CO2 emission and harmful residuals. No violent treatment or toxic extraction methods, astringent chemicals, petroleum-based solvents or acids are used in the preparation of our minerals. Ever! NamanaLiri™ minerals have been energetically engaged – so the innate healing wisdom of these ancient plant materials are made available to support individual health, wellness and personal growth. We refer to our products as SMART products. What does SMART mean? We may not always know what your body needs at the deepest level, but our products know how to interact with your system to support you. Copyright © NamanaLiri - All Rights Reserved.